Two of the most popular recipes I have on the blog and on my YouTube channel are Colombian arepas and empanadas. And because of this, one of the questions I have been asked the most is how to substitute the precooked corn meal to make them? I get this question a few times a week, especially by people who live outside of Colombia and who live in places where they can’t get their hands on this product. For this reason I decided to film and upload the recipe on how to make the “masa” or dough without having to use the precooked corn meal. Making this masa is very easy as long as you have the right type of corn which is usually “white hominy corn” and every now and then “yellow or golden hominy corn“. And what is hominy corn? It’s simply a sugarless, dry corn that doesn’t have the outer shell. This type of corn has been used to make arepas, empanadas, tamales, natilla, buñuelos, pandebonos, among other things for hundreds of years. And actually, the precooked corn meal was not available until the mid 20th century, but before that, all of these recipes were only made by using hominy. Even though the flavor of this fresh hominy is somewhat better than the precooked corn meal, I always use the corn meal at home because the process to make the masa with the hominy takes way too long. However, it is a great option if you can’t find the corn meal wherever you are. 2. The next day, drain the hominy and put it in a cooking pot. The size of the pot depends on how much corn you are cooking. Cover it with enough water, then cover the pot and bring the water to a boil on high heat. Then, reduce the heat to medium low and cook the hominy for about 2 hours or until tender. Check the water level every 20 minutes and add more if you think it’s necessary. 3. Once the hominy has cooked, drain it well and let it cool completely. It’s very important to make sure that the hominy is as dry as possible so the “masa” or dough doesn’t come out too watery and soft. 4. 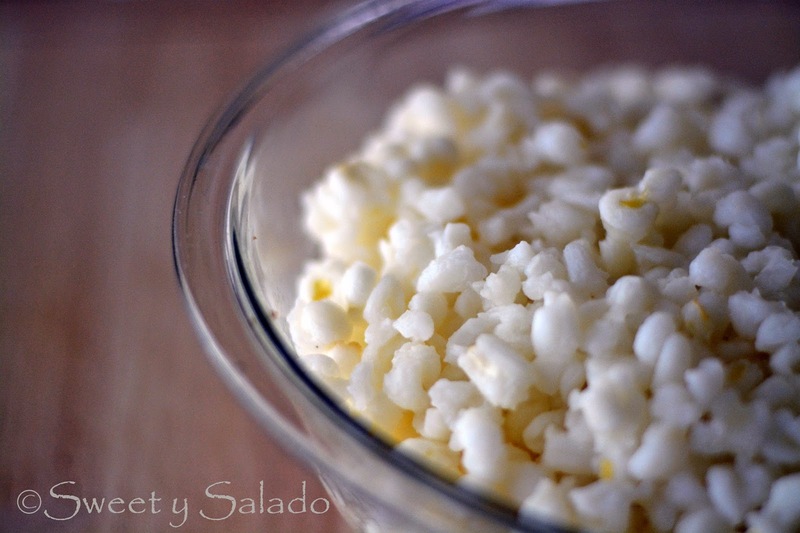 Grind the hominy using a food grinder or a food processor until you get a smooth dough. Season it to taste to make arepas, empanadas, and tamales. Hello, thanks for this recipe, but I am very confused about something that I hope you, as a native Columbian, can explain to me. 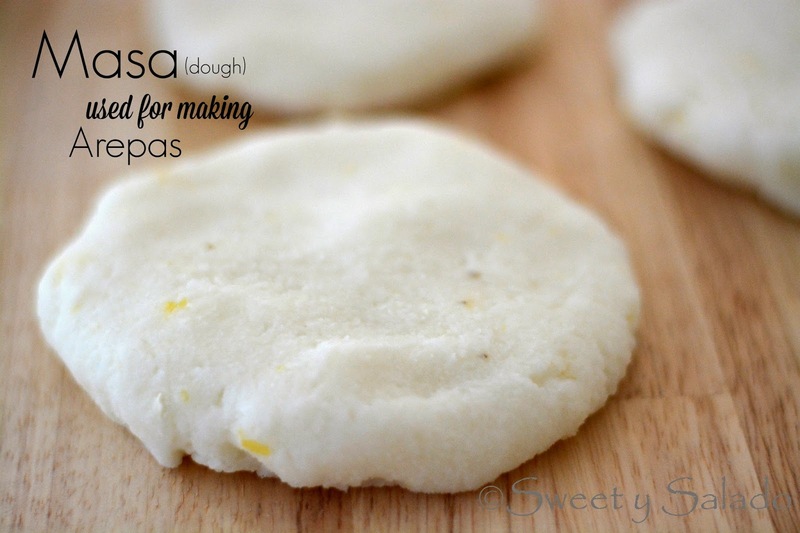 Everywhere I have read that for arepas, you can't use masa harina, because it is made from nixtamalized (alkali-treated) corn. Even you say that the corn flour used must be "pre-cooked" corn flour, NOT masa harina. BUT, here you are using ground hominy in place of pre-cooked corn flour, and hominy is nixtamalized, just like the corn for masa harina! So how is it different? Thank you so much for the detailed information! Using your directions I can now tell what the difference is between dough for tortillas and dough for arepas. When the nixtamalized corn is cooked for grinding to make tortillas, it is NOT cooked until it is soft, unlike the corn for grinding to make arepas. If the corn is over cooked, it will be too soft for making tortillas.Knowing the difference between the two doughs, it MIGHT be possible to use masa harina, if it is mixed with water and then cooked in a pot on the stove, to allow the corn to become soft enough. A quick whiz in a food processor would make the dough smoother. Sounds like a lot of stuffing around, but with a good nonstick pot, it shouldn't actually be hard to do, sort of like making a very stiff polenta, but using nixtamalized corn flour.Where I live, I can't buy masa harina, so I've started making tortillas from scratch. Using the information you have so kindly provided, I can now make arepas too, by cooking the nixtamalized corn until it is soft before grinding it. This is also be terrifically useful to know for those times when I get distracted and accidentally over cook the corn; no tragedy, just make arepas instead of tortillas! I'm very much looking forward to making arepas using the information you have given, but one thing I am unsure of is how they taste when cold. Are they ever eaten after they cool off, or can they be reheated?